This course is aimed for the Principal Designer or Designers on any construction project. If you are these key roles, based under CDM 2015 regulations and are unsure of what you have comply with then this course will cover these aspects and much more. 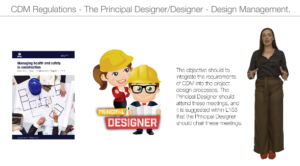 An outline of the requirements of the Construction (Design and Management) Regulations 2015 for the Principal Designer and Designers. Including definitions, applications and the main duties placed on these key roles. persons performing these duties on your behalf need to understand and appreciate the duties placed upon them. Even if persons such as managers and procurement do not directly perform these duties they need to have an understanding of the requirements.